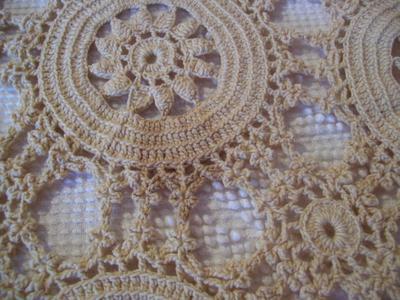 I am considering buying a vintage ecru crochet tablecloth I found online. I am very interested in this particular piece because it matches some other pieces I have. I am planning to use it as a bed coverlet, not a tablecloth. I have not seen it in person. However, there are stains right in the middle, which would therefore be impossible to hide. I would like to know how to remove them. I know I have done a few small stained pieces I already own, and the stains were very hard to get out without using bleach then having to re-dye them with tea. Even then, there was a trace left. It would be a huge pain if I had to bleach something this big and then try to re-dye it. I would have to do the whole thing, as bleaching really could not be done selectively. For all I know these could be years old, and may be set. They are light to medium brown and could be coffee or tea. I am motivated to do it if it is possible, though. I soak my vintage crochet in OxyClean. I let it soak a few days then check on the stains. I scrub it gently for a couple of seconds. If it still has stains (should be lighter by now) I put the piece in clean water with OxyClean and soak again. Good spray/soaking with Spray 'n Wash. Leave on at least 1 hr, then use your fingernail to sort of scratch it out, then rinse. If stain still there, do it all 2nd time. Go to the Stitchery.com for a product item T55-229. The cost is 17.99 for a lb jar. It removes coffee, tea and wine stains. It even removes fold lines. I hope that helps you out. A very gentle stain loosener that I use is a mixture of eucalyptus oil and water and when I'm desperate, undiluted eucalyptus oil. I let the piece soak in the eucalyptus for approx 1 hour then wash the piece and if necessary, repeat the process. I have two vintage crochet collars and the oil worked a treat in removing stains. I washed the collars afterwards in pure soap.